For most cat owners, one of the biggest drawbacks of owning a cat is the dreaded cat litter box. Not many people like to clean litter boxes. They aren't just smelly. Litter can be quite dusty and people that change litter boxes are more vulnerable to some cat diseases that can be caught by humans than people that do not change their cats' litter boxes. Luckily, there are several news littesr boxes designs that make the task of change cat litter much easier. One popular design is the hooded litter box. These boxes provide privacy for more sensitive cats, but they also help keep down litter dust. The hooded box is ideal for a single cat, as long as the cat's owners can change the box frequently to keep it smelling clean and fresh. For people who don't want to handle the soiled litter, there are removable liners for these boxes. Simply lift out the whole liner filled with soiled litter and discard it. Lay down a new liner, add fresh cat litter, and replace the lid. It is fairly easy to teach your kitten to use a litter box. The most important things for you to do are to position the litter box in the right place and to keep it extremely clean. Litter boxes should never be placed next to your cat's sleeping or eating spots, as cats do their best to keep these areas clean. If your cat does not use the litter box, do not scold him for his accidents. He will just become angry and frustrated. Instead, place the box in the spot where he most frequently has accidents and encourage him to use it. The Persian's most well known characteristic is probably it's face. This breed has tiny, rounded ears, very round eyes that are set far apart, and a short nose that gives the cat's face a pushed in appearance. A large, muscular body, a short neck, stocky legs, and a short, bushy tail complete the cat's distinctive look. These cats weigh in at eight to fifteen pounds. The Persian's beautiful coat comes in Black, Chocolate, Red, Blue, Lilac, Cream, Chinchilla, Silver, and White colors. White cats can have blue, orange, or mismatched eye colors. 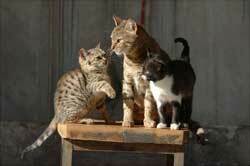 You can also find this breed in tortoiseshell, shaded, smoke, tipped, tabby, silver tabby, and bicolor patterns. While most Persians are usually fairly healthy cats, there are a few serious problems that are common to this breed. These cats are often prone to kidney disease, breathing problems that are the result of their compacted faces, and reproductive problems. 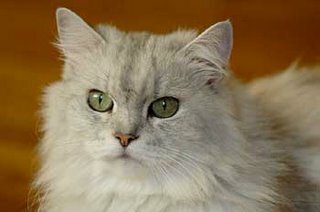 In addition, blue eyed white Persians are prone to deafness. If you are looking for a cat that is content to doze on the windowsills and enjoys an occasional petting, then the gentle Persian may just be the best cat for you and your family. Cat Hairballs - What you need to do ? Has your cat been coughing and hacking? He may have hairballs. If you see disgusting skinny oval blobs on the floor, you will know that your cat has managed to get out one of his hairballs.What exactly is a hairball? It is a mass of hair and food that did not digest that forms inside a cat's body. Loose hair that collects on his tongue when he grooms himself. The hair comes together and forms a ball in his stomach instead of simply passing through his body. These hairballs aren't able to break down and be digested, cats often cough them up to get rid of them. While most cats don't have a difficulty with dislodging hairballs, they can occasionally pass into a cat's intestines and cause a obstruction. This can be a life threatening problem. There are a few signs you should look for to find out if your cat's hairball is dangerous. If your cat seems to be constipated, he may be experience a small blockage. If he seems lethargic and his coat is dull and unhealthy looking, or he is eating less than usual, then he may have a serious blockage. Either way, you should take him to your veterinarian to be sure a hairball is the problem and to have it removed.It is much better to prevent hairballs than to treat them after they have formed. One of the easiest ways to maintain your cat from developing a hairball is to groom him frequently, especially if he has long hair. Thoroughly examine or brush his hair each day to remove excess hair. If you begin this routine when he is a kitten, he will actually look forward to being groomed. In fact, some cats will even bring their combs to their owners so that they can be groomed. If your cat doesn't care for brushes and combs, try a grooming glove, as an alternative.If your cat still seems to form occasional hairballs, there are several dietary aids that you can try. One of these aids is dry cat food that was developed to help prevent hairballs. Don't just buy the first bag of hairball formula cat food you see. Be sure that it is high in protein and other nutrients, as well. If your cat already has a hairball, you may want to shop for a gel that can be added to his food that will help the hairball pass through his body. This gel is actually a lubricant. Talk to your veterinarian before using one of these hairball remedy for a long period of time, as they can end up removing important vitamins and minerals along with hairballs.Finally, some people have their own remedies and recipes for removing hairballs. Before using folk remedies to care for your cat, please consult with your veterinarian to be sure you aren't unintentionally causing harm to some other part of your cat's body. A few common folk remedies are butter, mineral oil, and pumpkin. Many people are under the mistaken impression that cats are arrogant, moody creatures that will ignore their owners' attempts to train them. They think that cats could obey and choose not to. Although cats do ignore commands because they don't feel like doing what their owners ask, sometimes they are not obeying because they simply do not understand. Training a cat generally takes a lot more time and patience than training a dog. Positive reinforcement works better than negative reinforcement with cats. If you punish them, they will just wait until you are not watching to misbehave, so it is better to simply ignore wrong responses and lavish praise on your cat when he responds correctly.You should start training your cat when he is about eight to ten weeks old. However, if you have an older cat, don't let that stop you. It may be a bit harder to teach him, but old cats can learn new tricks.